It is based on sound principle (volatility breakout -> trend following). It is a price action system with only one indicator (ATR is used to measure volatility). It has a positive reward/risk ratio (average profit trade/average loss trade = 184/138 = 1.33). A win rate over 56%: Psychologically, more easy to trade. 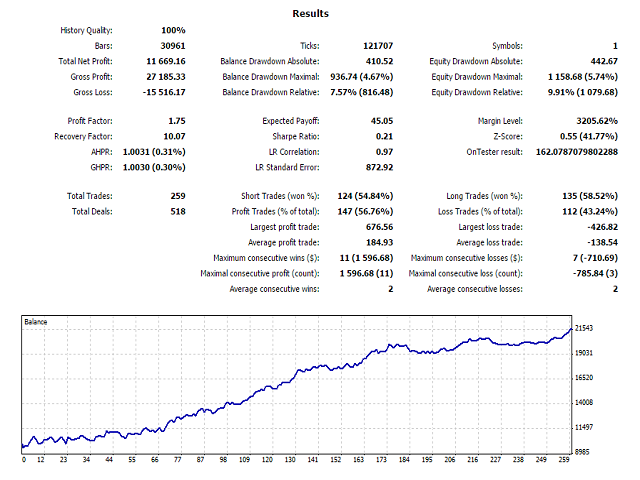 Excellent profit factor (Net profit/Maximum drawdown=10.07). It will work well in compounding mode. Robust: during the optimization phase, 96% parameters combination was profitable (691/720) (see Figure 3). High expected payoff ($45/1 mini-lot). The EA is less sensitive to spread and can be traded with any broker. 259 trades over 5 years (50 trades/year). The results of backtest are more statistically significant. There is a stop loss for each trade. You can sleep well, while the EA does the work for you. It can be traded with a starting capital as low as $250 for a micro account ($500 is more conservative). No risky money management like martingale or adding to losing position. Takes one position per week and this position is always closed before the weekend. During 5 years, the largest drawdown duration is about 8 months. But the drawdown is very reasonable. Need patience to make money. Two compounding algorithms: 1=Fixed risk; 2=Fixed margin. That's what make people rich if the EA has an edge. Be aware that compounding comes with large equity swing (Figure 4 shows profit with compounding mode for a starting capital of $1 000 and 5 years). With the same parameters, the EA makes profit on 14 over 24 currency pairs. Note that some currency pairs trend well and others are mean reversion ones (see Figure 5).